Wanted for Treason pamphlet circulated in Dallas on the very day of JFK’s assassination! The comparisons to much of the rhetoric and language used by the contemporary Religious and Political Rights smear-mongering, frighteningly contain the same sentiments of the above leaflet, which was handed out in Dallas, Texas the day of John F. Kennedy’s assassination. Indeed, words and phrases like “anti-American”, “anti-Christian”, and “treasonous” are more of a call to arms than a call to the ballot box. With this in mind, we should all be cautious of what the Republicans are aiming for in their attacks on Barack Obama. 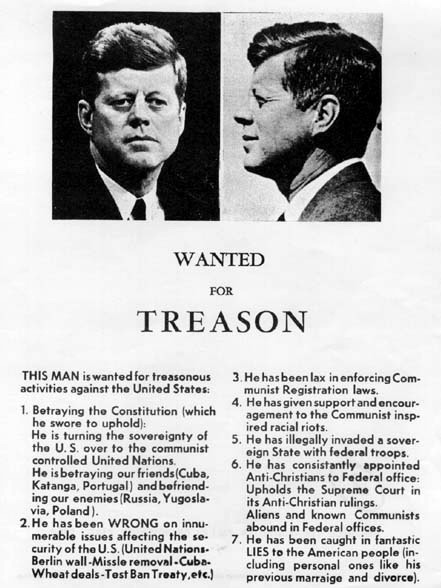 This flyer, around 5,000 copies of which were distributed around Dallas in the days before President Kennedy’s November 22, 1963 visit, accused Kennedy of a range of offenses, from being “lax” on Communism, to “appointing anti-Christians to Federal office,” to lying to the American people about his personal life. Clearly, the Religious and Political Right and the loopy clown car from Birtherstan, know exactly what they’re engaging in and fuelling here, and they’re on their knees praying day and night for a latter-day Lee Harvey Oswald, to help “solve” their paranoid fantasies and imaginary problem.